It took a simple question from an undergraduate student, “What is the weight of the cornea?” during a keratoplasty surgery that prompted the writing of this book on simple numerical facts and figures to do with the eye. 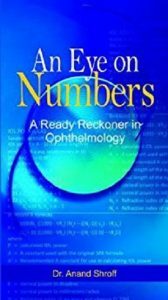 What began as a small personal handbook, saw thousands of additions made along the way as I traveled through various ophthalmology textbooks: measurements, values, dimensions, calculations, dosages, tables and nomograms, new drug additions, conversion charts used by ophthalmologists and optometrists in day-to-day practice. There is also a tribute to some of the pioneers of the field through a dateline of their achievements. This handbook ends the search for facts and numbers from a multitude of textbooks. The major benefactors would be postgraduate students, particularly those quizzed on rounds. Exam-goers will save precious time hunting for important information, drug dosages and thousands of bits of ‘important’ information. Chapters are initially divided anatomically and later by subject in keeping with an easy flow and retrieval of information. Born and raised in Mumbai, Dr. Anand Shroff is an experienced and respected Anterior Segment and Refractive Surgeon. His 15 years’ of expertise extends to surgeries of LASIK and EpiLASIK, Implantable Collamer Lens (ICL), Cataract including accommodative implants, Glaucoma and Cornea and has trained several ophthalmologists from all over the world during LASIK workshops in India and Europe. He is the pioneer of wavefront guided LASIK in India and works from the Shroff Eye Hospitals and Clinics in Mumbai. Both Shroff Eye centres, excelling in patient care for over 92 years, are the first eye hospitals in India to be awarded the JCI (Joint Commission International) accreditation from USA.